Investors think Overstock (NASDAQ: OSTK) CEO Patrick Byrne is crazy. That’s why his ecommerce company trades at a 0.3x price to sales ratio while Amazon (NASDAQ: AMZN) sits at 2.3x. I am flabbergasted. I mean, when people are questioning your sanity, the ideal response is not to appoint a poet and author from the EARLY 20th century. Is this the man to turn around a troubled internet retailer? 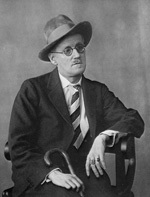 Recommendation: Short OSTK; with James Joyce behind them, it will be almost impossible to invest in OSTK without an accompanying guide to help you understand. This will severely and negatively impact demand from institutional and retail investors alike, who may claim “We love OSTK! We think it’s one of the greatest stocks ever!” but actually do not hold any OSTK in their portfolios. Greatest conference call in history! This is some of your best analysis. Reminds me of that time the overachieving Jerry Yang won the WSOP. how is this different than the current situation? I can’t wait for the guy who explained that it’s a different Jerry Yang. He might clear some of this up. Can anyone explain to me how it is possible that OSTK is still in business? I’m confused. I thought companies that hemorrhaged cash quarter after quarter for years, had insane executives, fuzzy accounting, ineffective discounting that reduced gross margins to practically nothing, and zero investor confidence went out of business. Matt… clearly you don’t know how being publicly held works. Vonage gets it – they’re winners. And they even do it while getting sued. If anything LoS’s analysis introduces law-suit arbitrage opportunities in the OSTK market. Well, with creds like these you’d bloody well expect the bloke to be capable of writing a decent novel, at least. So much’s the pity I suppose… but Long on his publisher in any case.